In this digital age, both job applications and interviews are undergoing a technological evolution. Questions that require video responses are now often found on job applications and interviews are regularly carried out over Skype. One revolutionary new hiring app that features questions requiring recorded responses on their job applications is Apploi. Whether through audio or video (two of Apploi’s features), this allows an employer to get to know the candidates in person prior to meeting them. The new advancements will also allow recruiters to meet more candidates than they typically would, reducing the time it takes to conduct interviews. 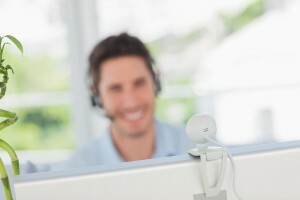 Video interviewing is also extremely beneficial to jobseekers. Instead of getting caught off guard by a question, they now have time to prepare and think deeply about the answer to provide. It also eliminates traveling to unfamiliar places and meeting with unfamiliar people. Of course it can be a little intimidating to film or record yourself answering a question at first but practice makes perfect. And if in doubt, re-record, re-record and re-record again. Make sure your recording space is lit appropriately and doesn’t cast shadows on your face. Try to keep the background as plain as you can. The interviewer wants to see you, not your room; so, set yourself up so that the video will show you from the shoulders up without too many distractions behind you. Just because you are not in a one-to-one interview doesn’t mean you shouldn’t look presentable. For the video interview, try to dress professionally. This doesn’t necessarily mean you should be dressed in a suit and tie, but not your pajamas either! Close other programs on your computer. Getting Facebook notifications during your interview is distracting and unprofessional. Be aware that the microphone may pick up surrounding noise in the room. So make sure you’re in a quiet space and try not to tap your pen or shuffle papers. Try saying the answer a few times without filming yourself. This will allow you to feel comfortable when it comes time to record. Remember, you can record yourself a few times, so it doesn’t have to be perfect the first time. Body language is key, particularly when applying for a role where you are expected to speak directly to a customer. The employer wants to see that you are customer-friendly, and a combination of eye contact (by looking directly at the camera), a good posture, and friendly body language will help to prove that. Be aware of how long you take to respond to questions. You have a one-minute limit to your response, so try to strike the balance between giving a short response and a sufficiently detailed response. Most questions are easy to answer in 45 seconds, and that’s what you should aim for. It is important to tell the employer that you want “the job” rather than just “any job.” Show that you are serious about the position by demonstrating that you have researched the company to which you are applying. When answering the question, keep in mind your job description and expectations of the role to better focus your answer. Confidence and enthusiasm go a long way in making you appear personable. So smile and show off those pearly whites! Try to be as clear and articulate as you can. Avoid mumbling, long pauses, and hesitations. Employers know you are human. Don’t be afraid to make a mistake. If you would like to correct yourself, do so and continue with your answer or retake if you prefer. Focusing on speaking slowly will also help you to feel calm and collected. Imagining that you are talking to a friend also helps to feel less nervous.